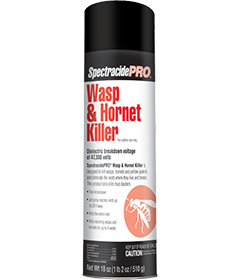 SpectracidePRO® Wasp & Hornet Killer is designed to kill wasps, hornets and yellow jackets and eliminate the nests where they live and breed. This product also kills mud daubers. Barrier, perimeter or band applications to soil or vegetation around structures up to a maximum of 10 ft away from the building. Applications to building foundations, up to a maximum height of 3 ft.
Other than applications to building foundations, all outdoor applications to impervious surfaces such as sidewalks, driveways, patios, porches and structural surfaces (such as windows, doors and eaves) are limited to spot and crack-and-crevice applications only. Never use indoors. Do not apply to people or pets. Do not contaminate feed, foodstuffs, dishes or utensils with spray. Before using in areas where spray may contact home siding or roof shingles, test in an inconspicuous area and recheck in a few hours. Apply at sunrise or sunset when insects are least active. Stand a safe distance from the nest. Don’t stand directly underneath. Spray the nest until soaked. This product’s powerful spray will also kill insects that return to the nest. Spray one to two seconds, until surface is moist, to kill wasps, hornets and yellow jackets under eaves and around screens, windows, doors, patios, cracks, holes and crevices or wherever else insects are noticed. To prevent insects from entering the home, spray around areas where insects enter, such as outdoor plumbing, faucets, etc., and cracks or crevices in foundations as well as along sills and ledges. CAUTION. Causes moderate eye irritation. Avoid contact with eyes or clothing. Wash thoroughly with soap and water after handling and before eating, drinking, chewing gum, using tobacco or using the toilet. Remove clothing immediately if pesticide gets inside and wash clothing before reuse. Prolonged or frequently repeated skin contact may cause allergic reactions in some individuals. Immediately call a Poison Control Center or doctor. NOTE TO PHYSICIAN • Contains petroleum distillate – vomiting may cause aspiration pneumonia. This pesticide is extremely toxic to aquatic organisms, including fish and invertebrates. Do not apply directly to or near water. Drift and runoff may be hazardous to fish in water adjacent to treated areas. See Directions for Use for additional precautions and requirements. This pesticide is highly toxic to bees exposed to direct treatment on blooming crops or weeds. Do not apply this product or allow it to drift to blooming crops or weeds while bees are actively visiting the treatment area. FLAMMABLE. Contents under pressure. Keep away from fire, sparks and heated surfaces. Do not puncture or incinerate. Exposure to temperatures above 130°F may cause bursting.